Rand continues: "There are three interrelated arguments used by today’s “conservatives” to justify capitalism, which can best be designated as: the argument from faith—the argument from tradition—the argument from depravity." It is important to reiterate what I have stated in previous posts: all these “moral-base” arguments are mere rationalizations covering a complex blend of motives, interests, and sentiments that could never be summarized in a handful of broad moral injunctions. Rand commits the error of greatly exaggerating the influence of moral-base arguments. Her remarks about faith-based rationalizations must be seen in this context. Note that Weber does not claim that there is a connection between religious “doctrine” [i.e., religious rationalizations] and business acumen; no, Weber specifies the connection exists between the “religious way of life” and business acumen, a different matter altogether. The religious way of life is rarely, if ever, entirely consistent with religious doctrine. How could it be? Religions contain dogmas which, if taken literally, would overstep important practical realities. Such doctrines have to be reinterpreted to fit the practical demands of everyday life. The effect of religion is not in all cases as irrational as Rand would have us believe. Religion may, and often will, leave plenty of room for practical success in life. This does not mean that the “non-practical” (or “irrational”) side of religion has no effect at all. But the so-called “irrational” side of religion tends to display itself in various non-practical pursuits, such as worship and ritual. To a non-religious person, the amount of time and effort spent by intensely religious people in practicing their faith may seem like a horrid waste of time. Yet, ironically, there may exist positive benefits from this sort of non-logical behavior. Ritual and worship, whatever might be said against them, are entirely consistent, and in some measure may promote, some of the virtues necessary to succeed in business, such as sobriety, monogamy (divorce, mistresses, adultery are expenses the frugal businessmen can do without), self-discipline, etc. In any case, it is simply a fact that, in the early stages of capitalism, the business class tended to be dominated by the intensely religious. This fact can hardly be elucidated on the basis of Rand’s doctrinal view of religion, which attempts to explain the behavior of religious people on the basis of the “fundamental” premises of religion. Neither human nature nor religion work in so simplistic a fashion. Intellectually, to rest one’s case on faith means to concede that reason is on the side of one’s enemies—that one has no rational arguments to offer. The “conservatives’” claim that their case rests on faith, means that there are no rational arguments to support the American system, no rational justification for freedom, justice, property, individual rights, that these rest on a mystic revelation and can be accepted only on faith—that in reason and logic the enemy is right, but men must hold faith as superior to reason. Consider the implications of that theory. While the communists claim that they are the representatives of reason and science, the “conservatives” concede it and retreat into the realm of mysticism, of faith, of the supernatural, into another world, surrendering this world to communism. At the core of Rand’s criticism is the implicit claim that her moral rationalizations are superior (i.e., more convincing) to those of conservatives. Yet this goes against a very well established fact—namely, that there are a great many more conservatives than there are Objectivists. Of course, such rationalizations are only persuasive to those already inclined to believe them; which is why Rand’s complaints on this score seem much ado about nothing. Claiming that the moral base for capitalism is religious faith may not sound very convincing to the secular enemies of the free market; but Rand’s "reason"-based rationalizations have not been a jot more convincing to such individuals. Changing people’s minds through arguments (i.e., rationalizations) is very difficult and not very effective. Especially ineffective are broad arguments based on abstract moral principles. Most human beings instinctively sense that such arguments are hollow and not to be trusted. Moreover, because of their vagueness, broad, abstract principles do not yield any clear specific guidelines for practical actions, but can be interpreted to fit a variety of specific guidelines. So people tend to follow, instead, the complex web of strategies for navigating through the problems of life that they have learned and absorbed through years of trial and error experience. Commenter Orin T sends us to the following excellent post on fundamentalism by David Sloan Wilson. Wilson analyses Rand and finds her work as fundamentalist as an Hutterite epistle of faith. I now had a serviceable definition of fundamentalism--a system of beliefs that alleviates serious decision-making on the part of the believer. A fundamentalist belief system is manifestly false as a factual description of the real world; otherwise the believer would be confronted with messy trade-offs. Nevertheless, a fundamentalist belief system can be highly adaptive in the real world, depending upon the actions that it motivates. It can even outcompete a more realistic belief system that leaves the believer fretting endlessly about all those messy trade-offs. My second insight about fundamentalism came when I coded Ayn Rand's book of essays setting forth her creed of objectivism titled The Virtue of Selfishness, along with a more obscure book titled The Art of Selfishness written by a self-help author named David Seabury. Once again, after dozens of words and phrases had been coded, written by Rand with her highbrow pretentions or Seabury in his homey style, two boxes of my table remained empty. Judging by the absence of tradeoffs, their tracts were every bit as fundamentalist as the Hutterite epistle of faith. It didn't matter that Rand was an atheist who called herself a rationalist. She used her talents to create a belief system that becomes a no-brainer for anyone who steps into it. She even stated explicitly in one of her essays that "there are no conflicts of interest among rational men." Ayn Rand contra Conservatism 2. In her “Conservatism: an Obituary,” Rand proceeds with one of her favorite arguments: the “moral” base argument. It’s is Rand’s contention that capitalism requires a “moral base.” “Politics is based on three other philosophical disciplines: metaphysics, epistemology and ethics—on a theory of man’s nature and of man’s relationship to existence. It is only on such a base that one can formulate a consistent political theory and achieve it in practice.” The moral base of capitalism, Rand averred is “egoism” or “selfishness.” “Altruism,” however, was antithetical to capitalism. [Conservatives] are paralyzed by the profound conflict between capitalism and the moral code which dominates our culture: the morality of altruism . . . Capitalism and altruism are incompatible; they are philosophical opposites; they cannot co-exist in the same man or in the same society. Rand is wrong in so many ways on this one that it is difficult to untangle the masses of intertwined error. But let us give it a try. Both from common experience and psychological research we know that human beings, generally speaking, are inveterate rationalizers, particularly when it comes to issues touching their own interests and predilections… What makes rationalization so very easy and so very inevitable is the scandalous ambiguity of words. It is so very easy to equivocate our way to the conclusion we desire. The equivocation is so artfully masked by the ambiguity of the terms used that it remains unnoticed…. Rand makes use of [this] ambiguity ... when distinguishing between egoism, on the one hand, of which she approves, and altruism and “self-sacrifice” on the other, of which she strongly disapproves. Self-interest, for Rand, is good; living for others is evil. These paradoxes arise because Rand could not bring herself to be consistently selfish. There were some conventionally altruistic acts which she approved of. But since she was loathe to admit this, she merely called meritorious altruistic acts selfish and rationalized this odd usage away by redefining the term sacrifice in a way that entirely flouts and tramples upon common usage. Thus we find her declaring: "If a mother buys food for her hungry child rather than a hat for herself, it is not a sacrifice: she values the child higher than the hat; but it is a sacrifice to the kind of mother whose higher value is the hat, who would prefer her child to starve and feeds him only from a sense of duty." So the mother who values her child more than she values her hat is acting altruistically if she buys the hat! And the mother who buys food for her child although she would prefer a hat is also acting altruistically! Error 2: Rand assumes, despite all the evidence to the contrary, that ethical theories—or, rather, ethical rationalizations—determine political conditions. It is important to understand what Rand asserts in this context. By ethics, she does not mean proclivities of action, sentiments, interests, or any other emotive or non-logical phenomenon. On the contrary, she means a specific ethical theory stated in broad principles. It is these principles which Rand declares determine all the sentiments, interests, and political motives that shape the social order. In countless posts (including this one ), I have criticized this conviction of Rand's. It goes against everything that scientific psychology and cognitive science teach us about human nature. Error 3: Rand assumes, without doing any research, that people determine their ideological allegiances based on their ethical premises. It is amazing how many times one finds Rand taking this controversial point for granted. But perhaps that’s just as well, because the way Rand sets it up, her view becomes empirically untestable. If an individual supports socialism, Rand would tend to believe that individual held “altruistic” ethical premises, regardless of that individual’s professed beliefs. 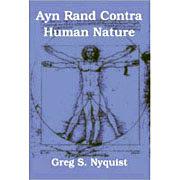 (If the socialist professed himself an "egoist," Rand would probably claim that he held "altruistic" premises in his subconsious.) How does she know this? She simply takes it for granted that ethical beliefs must determine political beliefs, regardless of the evidence. Error 4: Rand suggests (at least tacitly) that no individual can consistently favor free markets because they produce more wealth and a greater standard of living for more people than alternate systems without suggesting or implying “altruistic” premises. Rand is (perhaps unwittingly) implying that it is dangerous or ineffective to base arguments for free markets on benevolence. But assuming that that more people will be “better off” under free markets than under other systems, why is it wrong to support capitalism for this reason rather than for self-interest? Many people are turned off by self-interest arguments for the very sensible reason that self-interest is not always benevolent. Rand’s stress on the so-called "moral base" inevitably suggests a motivational argument that stresses intention (egoistic intentions versus “altruistic” intention). But it’s not clear that intentions are all that important in social issues. What is most crucial is the end result. And if the end result of free markets is “better” than the end result of other systems, wouldn’t arguing on the basis of the end result prove more effective? Rand simply misunderstands conservatism when she tries to interpret and criticize it through her assertions about capitalism requiring a moral base. Sophisticated conservatives don’t frame the issue in that way. They look at outcomes, not motives, intentions, or moral bases. They understand that what Rand calls a “moral base” is, for many people, merely vague moral sentiments that can often be interpreted in disparate, conflicting ways. Most people have both egoistic and altruistic sentiments. But because people seek pleasure and avoid pain, the self-interested motives, in the ordinary course of life, tend to predominate, regardless of whatever moral principles they pretend to pursue. Hence the value of Rand’s moral base argument is grossly exaggerated by her disciples. Ayn Rand contra Conservatism 1. One of Rand’s weakest articles is her “Conservatism: an Obituary,” which was based on a speech she made in 1960. Rand had at one time identified with conservatism and had even taken part in the nascent conservative movement of forties. But she had become frustrated at the lack of ideological purity she found among her conservative friends. “[T]hey were not for free enterprise,” she complained, free enterprise “was not an absolute in their minds in the sense of real laissez-faire capitalism. I knew then that there was nothing that I can do with it and no help that I can expect from any of them.” Nathaniel Branden encouraged Rand to break with conservatism. “We have nothing philosophically in common with them,” he told her (which is true). [Goddess of the Market, 146] When William F. Buckley, through the auspices of Whitaker Chambers’ incendiary review, “Big Sister is Watching You,” basically made it clear that Rand was not welcome within the conservative movement, Rand’s separation from her former allies was complete. Rand’s essay “Conservatism: an Obituary” must be seen in the context of Rand’s growing hostility toward the Right in America. the Golden Rule turned upside down, in which one expects to be treated better than one treats others. But no, Rand was apparently too self-absorbed, too narcissistic to even notice she was reinforcing the very stereotypes about egoism and selfishness that she had so strenuously denied in her ethical rationalizations. The first accusation she levels against conservatives is a moral one. She denounces conservatives for refusing to own up that their goal is freedom. Since Rand does not give any examples, it is difficult to figure out what on earth she is talking about. In any case, the contention that “most” conservative intellectuals are guilty of “apologizing for their own ideal” and attempting to “trick people into freedom” is grossly implausible. Wherever we find Rand failing to provide evidence for some controversial and implausible assertion, there’s usually a very good reason—namely, because she doesn’t have any evidence to provide. She’s merely making stuff up (no doubt unconsciously) to fit a particular ideological narrative which she wishes to promote. Rand next turns her attention to her favorite political argument, that is to say, her contention that capitalism requires a “moral base.” It is this contention, and the criticism of conservatism that Rand infers from it, that will be the subject of my next “Objectivism and Politics” post.